Finally, my meditation ends just as night falls. The trail of blood had led me to the knife and letter. A short discussion with the man who posted the contract later, and I had identified the spirit plaguing this village, a woman who had been separated from her lover and killed by a jealous suitor, now damned to roam the fields as a nightwraith. I followed the trail to the lovers’ meeting place, and readied. Lore about nightwraiths stresses preparation. I oil my silver blade with Spectre Oil, especially painful to a spirit of this type. Things will be tough enough, knowing she will only gain strength as night stretches on. I ready my Yrden sign, knowing the magical trap will be needed to force the spirit to materialize if I hope to kill her. The lore also calls for Moon Dust bombs, but I have yet to find the recipe to make such an item, so I make due without. Now as ready as I was going to be, I place the knife and letter into the nearby campfire, and begin meditating as I wait for her to arrive. Just after sunset, I hear the approach of the spirit behind me. We clash as lightning tears the sky around us. Yrden works as promised, forcing the spirit into a solid form. I mistime my attack, and suffer multiple strikes as a result. I chug a Swallow potion, hoping I can fend her off long enough for it to knit some of the wounds the spirit has already dealt. Luckily, the spirit chooses this time to disappear and summon three mirror images of herself. These I bring down with one strong swing of my silver sword each. She returns, and I again cast Yrden, forcing her to solidify. I resume my assault , a delicate dance of frantic silver slashes and near miss dodges. Finally, she screams as she is consumed in green flame, leaving only a large pile of ashes. I dig through the ashes for anything of note, return to the contact poster, and collect my reward. I shrug off his gratitude, and look for a nearby tavern. Could use a good game of Gwent after all that. Ploughin’ spectres. Guys, I cannot properly express how much I am enjoying this game. That whole thing above? One single side quest. This is ,simply put, one of the best RPGs I‘ve ever played. All of the sidequests have a life and story of their own. The witcher contracts are just awesome. I love taking a contract, and then playing CSI/Batman as I search for clues behind the type of monster I’m looking for and how best to deal with it. The combat is easy to learn, but requires skill to master. With the right mix of preparation, skill and luck, it can allow you to beat opponents marked far above your own. With the wrong mix however, and even a pack of wolves below your level will rip you to shreds. It’s a joy to play. Adding in signs, parrys and abilities, and it all adds up to a sort of freeflow combat I can only compare to the Batman Arkham games or Shadows of Mordor. And the characters! The world is just full to bursting with interesting people to chat up. Even many of the monsters themselves radiate personality. That lovely guy up there is a rock troll, which has become my favorite race introduced in video games since Bioware dreamed up the Krogan. But many others exist. Murderous spirits, gluttonous Sylvans, and annoying as all hell Godlings all populate a world beaten down by war and nearly drowning in blood. If you haven’t played the previous Witcher games and are worried you’ll be lost, have no fear. 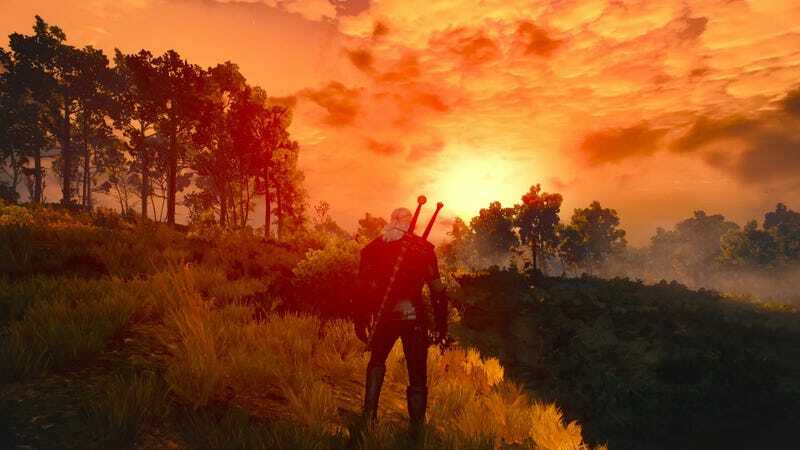 Outside of a few hours I spent with Witcher 2, I had no real knowledge of the background of this game, but the game seems designed to be self-contained, with very few moments I’ve been confused by a lack of prior info. I cannot possibly recommend this enough to anybody who enjoys open world RPGs. Now if you’ll excuse me, I spotted a winged beast flying over the crest of the next hill,and I’m betting it’s guarding something I want.